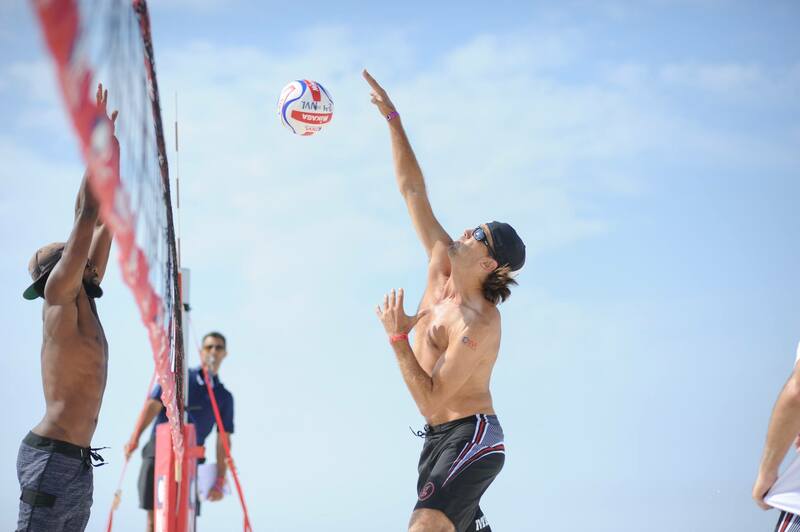 The top womens’ teams are ramping up for the 2015 Madeira Beach Championships and it’s anyone’s tourney to win! The competition will be fierce, so make sure you watch the FREE webcast! The reigning Panama City Beach (PCB) champs, Karolina “Kaya” Sowala (Best Offensive Player & MVP 2014) & Brooke Niles (Best Defensive Player 2014), are looking to continue their winning ways in Madeira Beach. Kaya, AKA The Polish Hammer, loves to hit hard and will take over a game with her 2-ball offense. Combined with Brooke’s stellar defense and experience, this team is a force to be reckoned with. They come into the event as the #1 seed, but there are a lot of other great teams vying for the crown. Veteran player, Priscilla “Pri” Piantadosi-Lima has a new, experienced partner in Kristen Batt-Rohr for 2015. Finishing 3rd in PCB surely lit a fire under this team, who wants to be in the finals every event. Pri’s desire to be the best coupled with Kristen’s big block and atheticism makes this team a tough draw. Pri is a very consistent player who demands a lot from her partner. Kristen is an excellent blocker who plays well under pressure. Keep an eye on this team, they’re sure to impress. Jessica Stubinski & Chara Harris are no strangers to center court. This hard working team always puts on a defensive clinic during their matches. Jessica, voted NVL Breakthrough Athlete in 2014, gives 100% on every play and Chara has incredible court awareness, making them a handful for any team. Since they’re both natural defenders and right sides, they rely heavily on their ball control and communication to win games. This unlikely duo lost a hard fought battle in the semis against the eventual PCB champs, Kaya and Brooke. If you want to see two dynamic athletes who have mad skills, this is the team for you. Returning for their 2nd season as a team, Jennifer Snyder & Chelsea Hayes (Rookie of the Year 2014) were not happy with their 5th place finish to start the season. This is a team that knows how to win, so don’t be surprised if you see them back on top very soon. Jenn is a crafty vet and a fierce competitor who puts up a big block. Chelsea plays great defense behind Jenn and rarely misses an opportunity to score a point in transition. They have solid chemistry on the court and are fun to watch. If only you could hear the commentary in between points…. Another returning team, Molly Menard & Michelle Williams had a close battle in PCB to make the semis, just falling short in the 3rd game. Molly has proven herself as a consistent right side defender, seeing most of the serves and finishing 5th numerous times. Michelle can take over a match with her option hitting and can shut down the other team with her blocking. This is not a team to take for granted. These two athletes have great chemistry and are tough to beat when they are in sync. They are hungry to break into the semis and have all the tools to make it happen. Back for the 2015 season, Alicia Zamparelli-Flavia & 6’4″, full time blocker, Lindsey Fuller are looking to make waves. With a full off-season under their belt, veteran Alicia has had plenty of time to sculpt Lindsey into an aggressive blocker and hitter. Alicia is a leader who knows how to win and get the most out of her partner. Lindsey, voted NVL Most Improved Player in 2014, wants to show that she has what it takes to be a dominant force on the tour. We see some upsets in this team’s future. Veteran player, Tarin Keith joined forces with an up-and-coming rookie for the 2015 season, Laurie Bachler. Laurie is a big blocker with huge hitting range and a fire to win. She has worked hard through the off-season to hone her skills and has big goals on the tour this year. Tarin is a solid 6′ tall defender with a wide range of shots and uses her experience as a weapon. Her strategy on the court will help take this team to the next level. They just might surprise you if you’re not ready for them. The great thing about this event is the additional teams who are vying for a top spot. This includes Jayna Duke/Lauren Dickson and Jules Ridley/Kerri Schuh. Both of these teams have battled with the top seeds and have let their presence be known. Keep an eye out for these ladies, they are working hard and loving the challenge. Fun Things to Watch For on the FREE Webcast!